On the 18 April, 1910 the mounted constable made a patrol to the police paddock, and while he was returning his troop horse began to buck. The horse then bolted and Senior Constable Smith was thrown violently against a tree, sustaining severe internal injuries. Knowing he would not be found before it became dark, he began to walk towards town. When he had travelled a short distance he was found by some men who helped him into Euston in a barrow. A doctor arrived from Balranald that night and after examining the injured man made arrangements to have him taken to hospital. Unfortunately the vehicle conveying the injured constable to hospital broke down and he passed away. The Register newspaper of 25 April, 1910 reported that ” Regret is expressed at Wentworth ” at the sudden death of Senior Constable Smith, officer in charge of the police at Euston, 80 miles from Wentworth. The constable, it appears was thrown from his horse, which had stumbled and rolled on his chest. At first his symptoms were not considered serious but as the day advanced and while the constable was being driven to Balranald for medical treatment, he expired. He has left a widow and six children. The late constable was highly esteemed in the district, and was a general favourite. The senior constable was born in 1871 and joined the New South Wales Police Force on 11 February, 1897. At the time of his death he was stationed at Euston. 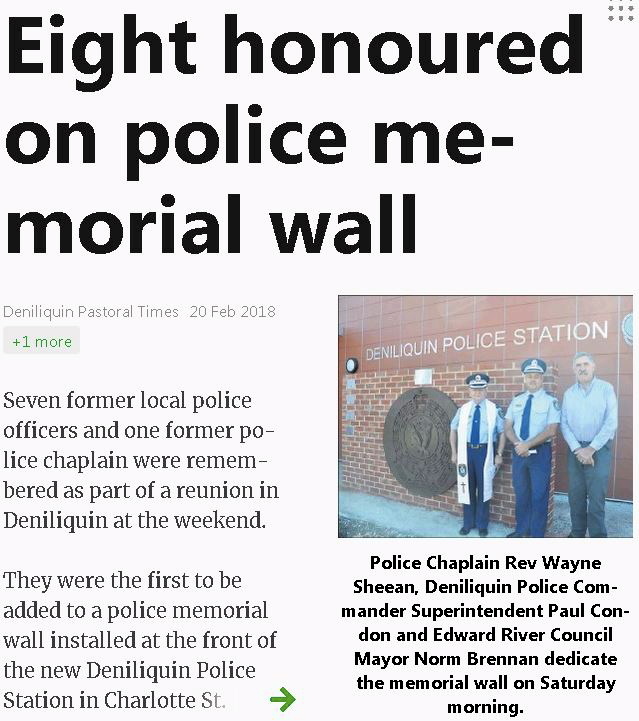 Seven former local police officers and a former police chaplain were honoured during a police reunion in Deniliquin. They were the first to be added to the police memorial wall at the new Deniliquin police station.